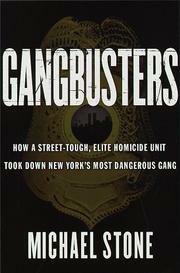 A murder investigation becomes a large-scale assault on drug gangs in this painstaking first book by New York City journalist Stone. When a college boy from Tarrytown, New York, was inexplicably shot to death on Manhattan's West Side Highway in 1991, no one believed the murder would be solved. The first tip came six months into the investigation, after detectives Garry Dugan and Mark Tebbens traced several multiple homicides to the "Wild Cowboys"—a lawless Dominican gang from Washington Heights. Selling drugs and guns for profits as high as $30,000 a week, they had turned their neighborhood into a war zone. They bullied children into delivering contraband and killed anyone who got in their way—even those who just happened across their path. The ensuing investigation, one of the largest in New York's history, inspired the formation of the elite Homicide Investigation Unit, headed by Walter Arsenault. This team of prosecutors and detectives shared a passion for justice, yet it succumbed to personality clashes that further complicated an already difficult job. The strained team dynamic during this crucial case raises the stakes in an escalating story of how nine gang members are finally prosecuted for conspiracy via an unprecedented cooperation of DAs from Manhattan, Brooklyn, and the Bronx. Making arrests was a dangerous task, as was the job of keeping timid witnesses from recanting. Yet piecing together effective testimony through a web of tenuous deals, pleadings, and promises could mean solving 37 homicides—including that of the Tarrytown boy. It would also clear the Cowboys from the streets and send a powerful message to other gangs who believed they could get away with murder. Overly detailed characterizations encumber an otherwise tension-filled tale of crime and punishment.